What will it take to save the world’s most endangered sea turtles? People are puzzling out an answer. Hundreds of sea turtles crawl out of the Gulf of Mexico and onto the sunny Mexican beach. Using their back flippers, they begin to dig madly—flinging white sand in all directions. It’s nesting time for Kemp’s ridley sea turtles! Once a mother turtle hollows out a nesting hole, she will drop 50 to 130 eggs the size of ping-pong balls inside. She’ll cover the nest with sand, rock her body back and forth over it to pack down the sand, and then head back to the water. Nearly all Kemp’s ridleys dig their nests along a 17-mile strip of beach in Mexico called Rancho Nuevo (see map). Some nest nearby or along the Texas and Florida coasts. But no other sea turtle species uses mainly one nesting area. 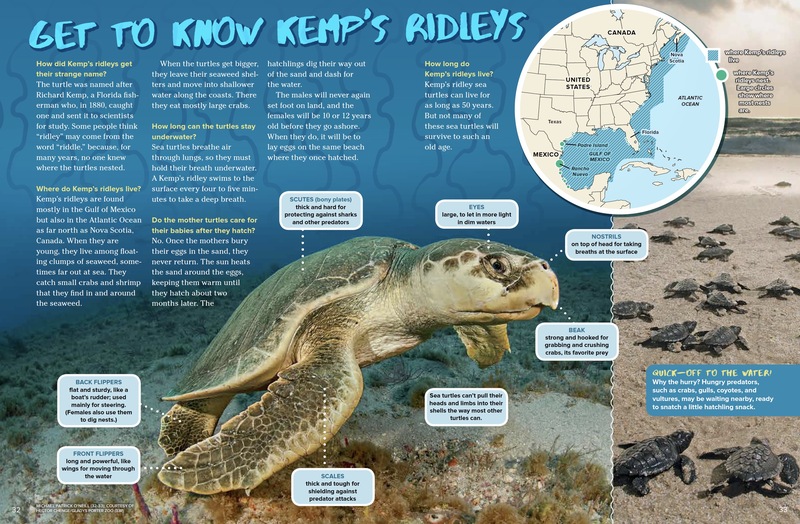 Kemp’s ridleys stand out from other sea turtles in two more ways. They’re the smallest—if you can call a 100-pound turtle the size of a trash can lid small! And they’re in the most danger of becoming extinct. But people have been working hard to help them, and Kemp’s ridleys are making a slow comeback. Want to know more about these amazing turtles? Keep reading! How did Kemp’s ridleys get their strange name? The turtle was named after Richard Kemp, a Florida fisherman who, in 1880, caught one and sent it to scientists for study. Some people think “ridley” may come from the word “riddle,” because, for many years, no one knew where the turtles nested. Where do Kemp’s ridleys live? Kemp’s ridleys are found mostly in the Gulf of Mexico but also in the Atlantic Ocean as far north as Nova Scotia, Canada. When they are young, they live among floating clumps of seaweed, sometimes far out at sea. They catch small crabs and shrimp that they find in and around the seaweed. When the turtles get bigger, they leave their seaweed shelters and move into shallower water along the coasts. There they eat mostly large crabs. How long can the turtles stay underwater? Sea turtles breathe air through lungs, so they must hold their breath underwater. A Kemp’s ridley swims to the surface every four to five minutes to take a deep breath. Do the mother turtles care for their babies after they hatch? No. Once the mothers bury their eggs in the sand, they never return. The sun heats the sand around the eggs, keeping them warm until they hatch about two months later. The hatchlings dig their way out of the sand and dash for the water. The males will never again set foot on land, and the females will be 10 or 12 years old before they go ashore. When they do, it will be to lay eggs on the same beach where they once hatched. How long do Kemp’s ridleys live? Kemp’s ridley sea turtles can live for as long as 50 years. But not many of these sea turtles will survive to such an old age. Years ago, Kemp’s ridleys would make about 125,000 nests at Mexico’s Rancho Nuevo and other beaches each nesting season. 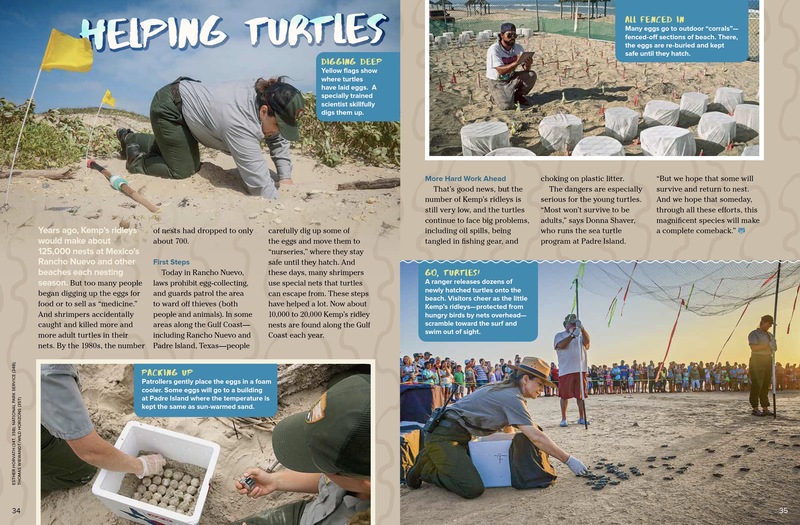 But too many people began digging up the eggs for food or to sell as “medicine.” And shrimpers accidentally caught and killed more and more adult turtles in their nets. By the 1980s, the number of nests had dropped to only about 700. Today in Rancho Nuevo, laws prohibit egg-collecting, and guards patrol the area to ward off thieves (both people and animals). In some areas along the Gulf Coast—including Rancho Nuevo and Padre Island, Texas—people carefully dig up some of the eggs and move them to “nurseries,” where they stay safe until they hatch. And these days, many shrimpers use special nets that turtles can escape from. These steps have helped a lot. Now about 10,000 to 20,000 Kemp’s ridley nests are found along the Gulf Coast each year. That’s good news, but the number of Kemp’s ridleys is still very low, and the turtles continue to face big problems, including oil spills, being tangled in fishing gear, and choking on plastic litter. The dangers are especially serious for the young turtles. “Most won’t survive to be adults,” says Donna Shaver, who runs the sea turtle program at Padre Island. 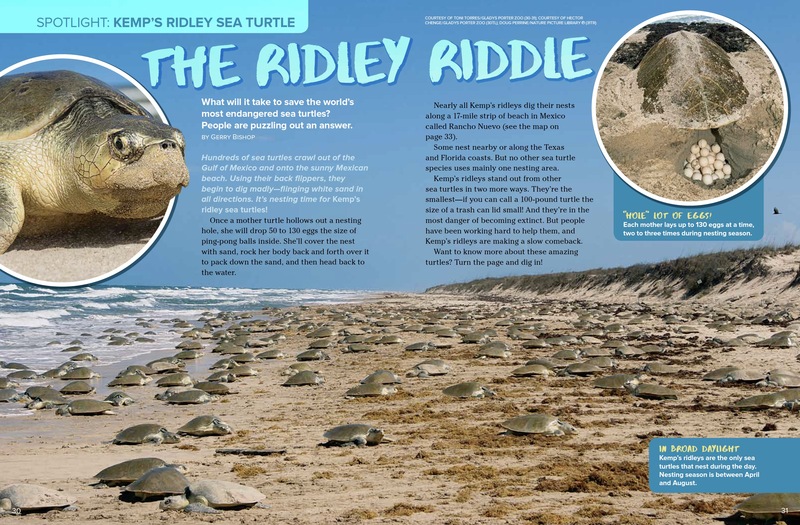 “The Ridley Riddle” originally appeared in the March 2017 issue of Ranger Rick magazine.